Privacy, carefree luxury, extensive gardens and swimming pool. Sleeps 8/10 in two dwelling units. Meticulous attention to detail ensures the comfort, privacy and carefree luxury of this unique property. 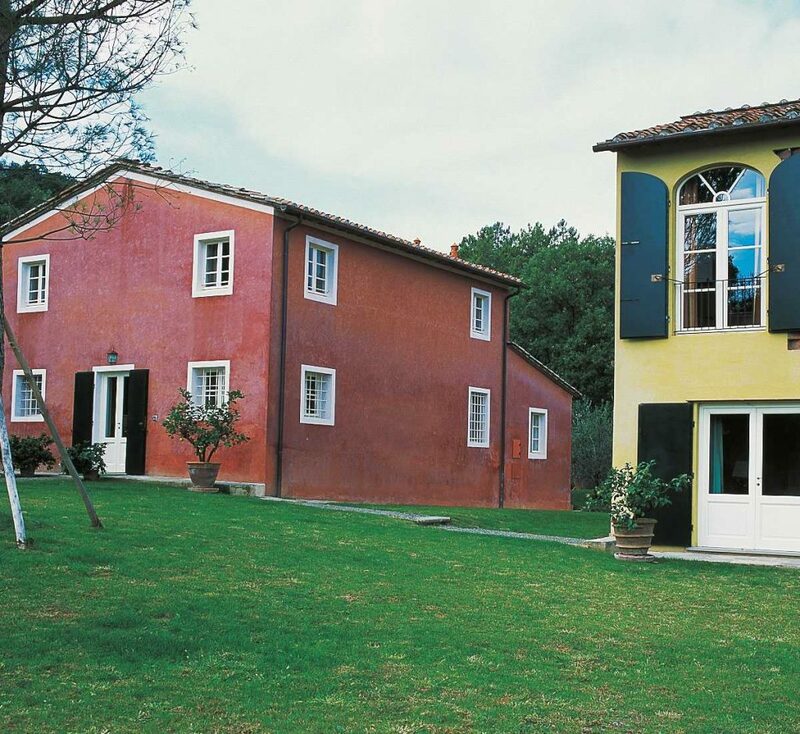 La Foresta comprises two dwelling units, varied and extensive gardens, outdoor leisure areas and an 11 x 5 metre swimming pool, all situated within a fenced private park in the hills above Lucca. This recently renovated rental property sleeps comfortably eight guests, with three bedrooms in the main house and one big bedroom in the converted barn. There are views over the valley, a vineyard near the property and the forest behind. The entrance has an automatic gate and there is ample parking space. The pergola in the front garden provides a shaded place from which to view the extensive lawn with its splendid olive groves. The garden overlooks the adjacent vineyard and the valley below. A bread/pizza oven is built onto the side of the main house. The entrance area of the house is open plan, with a wooden counter separating the cooking and dining areas, giving the whole a spacious and modern atmosphere. The modern ‘gourmet’ kitchen, in marble and stainless steel, is equipped with a 6-burner range and gas oven, dishwasher, microwave and icemaker. Also supplied are quality linens, tableware and cooking equipment. The kitchen fireplace adds warmth to the ambience. From the dining room a hallway leads to the living room, which occupies the rear part of the ground floor. Almost entirely glazed on the three outer walls, and overlooking the forest, it gives access through double doors to the patio and garden. The room has a large dining table on one side, while to the right there are large comfortable sofas and an entertainment centre with television, DVD and a satellite receiver. Leading off the hallway are, a laundry room with washer and dryer, ironing facilities and linen cupboard, a bathroom with shower and a double bedroom. This bedroom is smaller than those upstairs and not airconditioned, but very comfortable as a spare room for unexpected friends or for the nursemaid. A staircase leads from the dining room to the upper floor. All the bedrooms here are airconditioned with individual controls and have en suite baths. The bathrooms are bright and beautifully tiled, spacious and fully equipped. All the bedrooms are light, nicely furnished and have lovely views. The master bedroom has a large double bed and is very spacious and well appointed, with a tasteful combination of antique and modern furniture. The en suite bathroom has double washbasins, a bath and a separate shower unit. The second bedroom has a double bed and an en suite bathroom as above. It also has a walk-in wardrobe. The third bedroom on the first floor has twin beds and has an en suite bathroom with one washbasin and shower. Like the other rooms it is comfortably and tastefully appointed with antique and modern furniture. The second rental unit is a barn which has been converted into a roomy and open one bedroom house. The large barn door opens from the front garden onto the living room. The living/dining room fills most of the ground floor, with a small, beautifully equipped kitchen towards the back. A glass door leads to a covered terrace at the side of the house, with a built-in barbecue and sink. The patio looks over the private park and pool area and the forest beyond. The first floor comprises a large double bedroom with high ceilings and a small en suite bathroom. The furnishings include an imposingly large double bed of modern design, a similarly large armchair and a desk. The bedroom is airconditioned and is provided with an hi-fi stereo. The furniture in this house is more modern than, but just as tasteful as, that of the main house. The price includes three hours of cleaning twice a week usually on Tuesday and Friday. Change of bed sheets and bath towels once a week. The price does not include GAS, TELEPHONE and ELECTRICITY. Extra cleaning euro 20,00/hour. Prices are intended per week, from Saturday to Saturday.